Nearly half of the Metro track inspection department has been fired or is facing discipline in response to deep problems exposed by a July derailment. Metro also revealed Thursday that riders were put at risk Monday as third-rail power remained on while they were evacuated after cars on a new train separated. WASHINGTON — Nearly half of Metro’s track inspection department has been fired or staff members face disciplinary action in response to problems exposed by a July derailment. At the same time, Metro revealed Thursday that riders were put at risk Monday because the third-rail power was not turned off while they were evacuated after cars on a train separated. Metro General Manager Paul Wiedefeld said Thursday that four track inspectors and two supervisors have been fired, six more track inspectors are pending termination or unpaid suspension, 10 more track inspectors could face less serious discipline, one more supervisor is being fired, two more supervisors are in the administrative discipline process, two top managers have been demoted and one assistant superintendent left Metro before he could be disciplined. 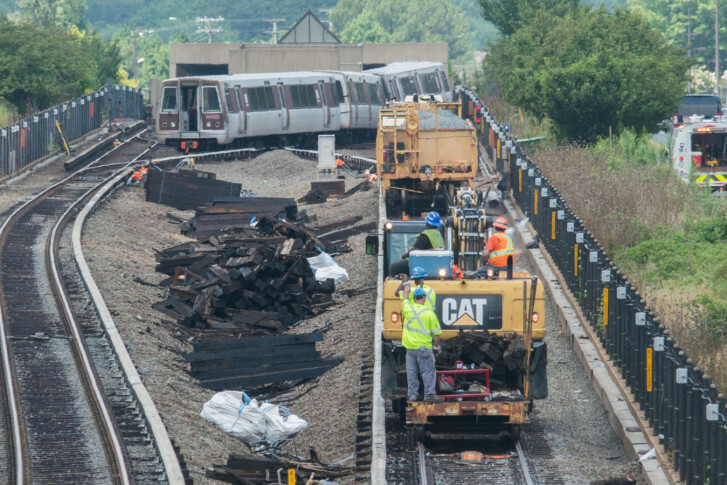 After the July 29 derailment near East Falls Church, Metro and outside investigators uncovered years of apparently falsified inspection reports. Metro inspectors also showed in interviews that they were not even familiar with what they were supposed to do. The derailment caused about $860,000 in damage. Three of the 63 riders on the train reported injuries; one went to the hospital with a head injury. Wiedefeld said he is confident the discipline has cast a wide-enough net. “This review revealed a disturbing level of indifference, lack of accountability, and flagrant misconduct in a portion of Metro’s track department, which is completely intolerable,” Wiedefeld said. He said the falsified reports were a systemic issue tied to Metro’s lack of safety culture. He could not say what the track inspectors were doing when they were supposed to be inspecting the tracks. Wiedefeld said Metro is filling the holes in its track inspection department with other Metro staff and some outside contractors. He promised the Metro Board’s Safety Committee that Metro is now inspecting all tracks twice each week, as agency policy has required for decades. For the second time recently, Metro evacuated passengers onto the tracks Monday while the 750-volt third rail was still energized, putting passengers at risk. At a Metro Board Safety Committee meeting Thursday, Chief Safety Officer Pat Lavin said the Metro workers who helped riders evacuate also failed to use proper evacuation ladders, in addition to putting riders at risk by leaving the power on. Lavin also revealed a possible cause of the separation of the new 7000 Series train into two parts on the Red Line Monday morning: The manual uncoupling mechanism was open on the third car. The first two cars pulled away from the rest of the train, which then automatically stopped. An inspection of other 7000 Series cars found no problems with the system, which would suggest human error led to the uncoupling Monday. The investigation is ongoing, and the Federal Transit Administration and National Transportation Safety Board have been notified. Two riders in the first two cars had to exit through the end of the cars and walk up the tracks to the station. A third person remained in the cars until they were moved up to the Rockville station. Riders in the rear six cars of the train were able to walk back through the end of the train through the last car, which remained on the Twinbrook platform. Metro’s largest union, which represents many of the workers involved, expects to fight the firings. “I don’t believe that terminating people is going to be the answer. It’s not the answer; it’s not what’s going to get WMATA to a safer culture. … Accountability starts at the top,” Jeter said. “I think all of the components are a part of it. It’s not just one. It’s management; it’s workers; it’s all of us,” she added. She said the union is conducting its own investigation, and she challenged accusations, supported by Metro interrogations, of track inspectors that reports were falsified. “That’s what they’re alleging, and if you talk to any of [the inspectors], you will find that what they’ve done is not necessarily falsification in their mind,” Jeter said. Jeter said she met with track inspectors this week who said they were never trained on how to inspect a switch, or who had just one week of training many years ago. She said workers not knowing how to properly do the job was a major part of the problem. “If it’s legitimate falsification, you won’t hear a peep out of me. But if it’s because I take a template and the switch doesn’t change, why did they have to change the form if the form that they gave them to make their report was acceptable? There’s a lot of nuances here and I think that you all will find out what those nuances are over time,” Jeter said. She did not learn about the scale of the firings until the information was made public at the Metro Board Safety Committee meeting Thursday morning. She said two workers were only fired earlier this week, and those were the only disciplinary actions related to this that she had been aware of before then.